Teosyal PureSense Redensity II is an innovative under-eye dermal filler that reduces the look of under-eye circles. Awarded as the winner of the best dermal filler in the 2nd Anti-Aging & Beauty Trophy, this filler significantly improves skin quality in a pain-free way because of its addition of a local anesthetic. This injectable adds volume to the eye area without overcorrecting while clearing away wrinkles and removing unwanted darkness under the eye. Its complex formula is created with cross-linked and non-cross-linked hyaluronic acid to maintain its strength within the skin, along with a nourishing balance of amino acids, antioxidants, and beneficial vitamins and minerals. This treatment will give your mature patients a revitalized look in the general eye area for up to a year. What is Teosyal PureSense Redensity II formulated to do? Trained medical professionals choose this dermal filler over its competitors for its balanced complex of cross-linked and non-cross-linked hyaluronic acid, which gives this product its light yet highly effective texture. This formula provides just the right amount of moisture and density to the skin to bring about volume that lasts without looking unnatural, lumpy, and/or disproportionate with the rest of the face. With the perfect concentration for the eye area, this hyaluronic acid can be injected with ease into the intended correction site. Plus, this treatment contains lidocaine to reduce any discomfort your patient may have during the injection process. This particular solution helps to repair the skin and, through its eight amino acids, three antioxidants, and several vitamins and minerals, creates beautiful-looking skin. Apply this injection to the periorbital area, under-eye circles, and tear troughs. Teosyal treatments are manufactured by Teoxane Laboratories for qualified healthcare professionals only. This cosmetic injectable is made in Europe. When can Teosyal PureSense Redensity II cause side effects? Although this formula has been designed to lessen the possibility of bruising and swelling due to the delicate nature of the skin around the eye, some mild side effects are may occur; these can include swelling, redness, and discomfort. These symptoms should clear within a few days. Refer to the filler’s package insert to inform your patients about more side effects, including the severe ones; general precautions; and contraindications before use. 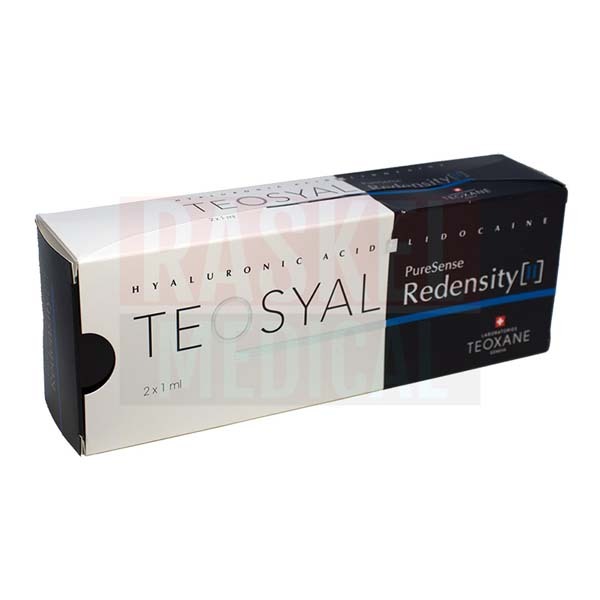 Which skin type is Teosyal PureSense Redensity II Lidocaine good for? Patients with mature and delicate skin types with thin skin will be able to use and enjoy this treatment to its full capacity without having to worry about unnatural-looking results. This formula is created with moisture-binding properties, and it is highly viscous, as that would thicken this filler’s texture and make it appear denser beneath the dermal surface. What is Teosyal PureSense Redensity II made without? This filler is entirely latex-free and is made from non-animal-sourced hyaluronic acid. This product’s packaging does not contain latex, and each syringe, needle, and cannula should be immediately disposed of after each use. Each tube and container is a single-use device. Open a new box for each patient. During an international clinical trial, 90% of patients noted that their skin had “improved” to “much improved”, thereby proving this filler’s ability to bring about safe, natural, and long-lasting rejuvenation beneath the eye. 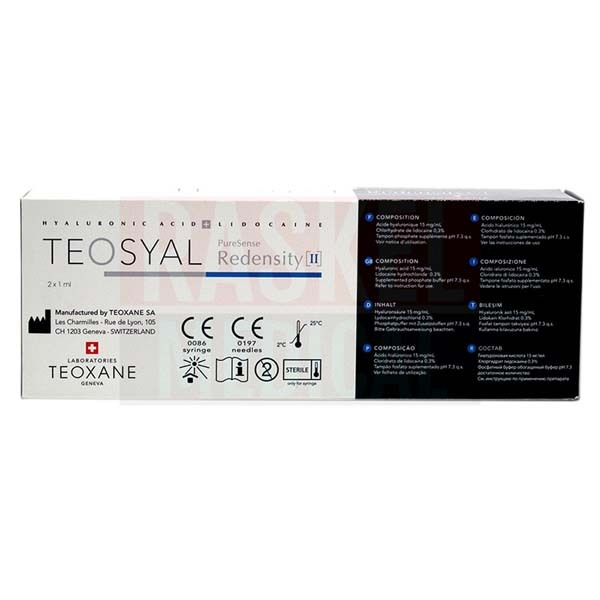 What is the difference between Teosyal PureSense Redensity II and Teosyal PureSense Redensity I? 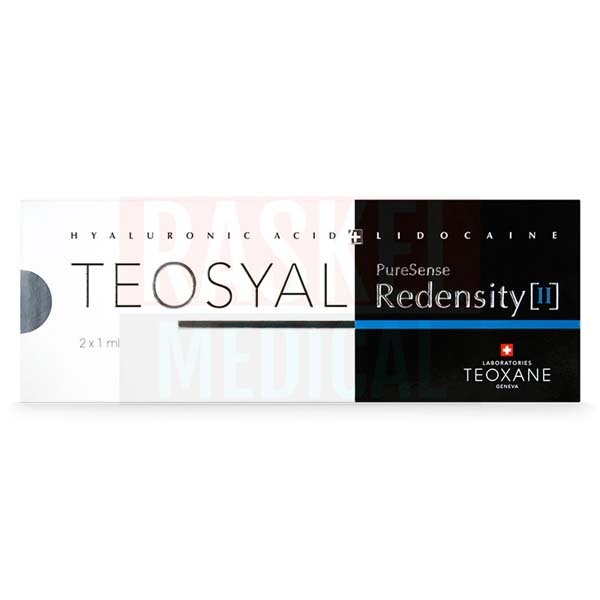 Teosyal PureSense Redensity II treats the skin imperfections around the eye, while Teosyal PureSense Redensity I restores the look of the entire facial oval, neck, and neckline by providing an inner radiance that shines through the dermal surface. Both treatments last for a year within the skin for results you and your patients can rely on. Occasionally, both products can last for longer than a year. A topical numbing cream is not needed, as this treatment contains lidocaine; however, another anesthetic can be applied as additional protection against discomfort if requested by your patients. Use the diagrams provided in the package insert for instructions on how to attach the syringe that contains this product to the provided sterile needle. Slowly inject the needle into the middle dermis at the site of the cutaneous depression. The amount of volume used will depend on the desired result; however, it is recommended that no more than 3ml of solution is used per session. After the injection is complete, gently massage the area to evenly distribute the injectable gel. Immediately dispose of used and unused tools, materials, and equipment after a treatment session. This injectable volume booster for the general eye area contains 15mg of hyaluronic acid, 3mg of lidocaine hydrochloride, and 1ml of phosphate buffer pH 7.3 qsp. Two prefilled syringes that contain 1ml of this solution. Two sets of traceability labels for you and your patients. Your patients will notice an immediate improvement to their eyes, and this effect can last up to a year or longer. Made specifically for the delicate skin around the eye, this filler adds natural volume and builds dermal thickness to this area for a healthier-looking appearance. Additional treatments can be made after this general timeframe. Like most dermal fillers, this treatment must be stored in the correct environment where the temperature is always monitored. The temperature must remain between 2–25ºC. This product must be kept safely away from sunlight. On average, this injectable can last between 18–24 months on the shelf when its unopened and unused. Refer to the storage instructions to keep this facial filler at its optimal condition for your patients. 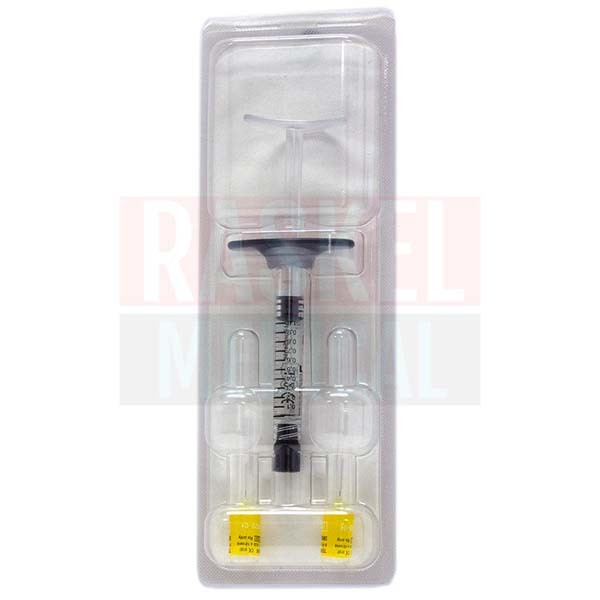 There’s only one place you can trust when it comes to finding top quality injectables, and that’s RaskelMedical.com, an online store that exclusively sells to licensed medical practitioners. From cosmetic to medical fillers, you can find everything you need on our website. If you happen to find the same item for a lower price elsewhere, simply contact our customer service team, and they will be happy to price match for you! But that’s not all—we grant first-time customers a 5% discount off their entire order! So, if you’re new to the Raskel Medical community, come join us, and get the treatments you love at the lowest prices on the market!